With outlets on FC Road, Baner, Viman Nagar, Kharadi and Kothrud, Chaitanya Paranthas is one of the most sought-after eateries for soul-satisfying, value-for-money paranthas. For those who never visited the eatery, we give you a list of top 5 highly-recommended paranthas from Chaitanya’s. Take a look. If you’re looking for a parantha that is full of flavours, go for the delicious Kashmiri Parantha made out of potato, paneer and dry fruits. 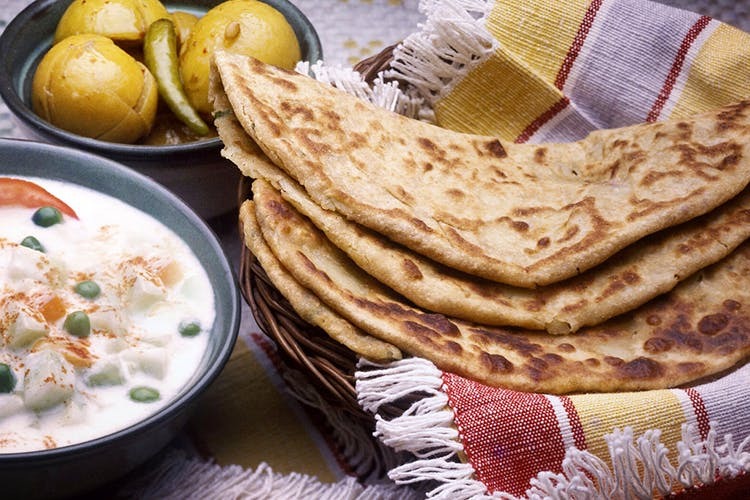 Priced at INR 120, we recommend you get a side of paneer peshawari along with this parantha. This parantha is quite simple yet immediately reminds you of a delectable mom-cooked meal. The aloo methi parantha comes with a side of curd, pickle and white butter and has been one of the classic bestsellers at Chaitanya’s for many years. If you’re the kind who loves all things cheesy and creamy, go for this parantha (for INR 140) that has a hint of garlicky flavour to it. Pair this parantha with a side of veg tawa and you’re good to dig in. There are a lot of rave reviews about the famous ragda parantha from Chaitanya’s. Stuffed with aloo sabzi, cauliflower, yellow peas and chopped onions, eat this belly-filling dish for only INR 90. When it comes to authentic Punjabi delicacy, nothing beats the mouthwatering Amritsari paneer paratha from Chaitanya’s. Priced at INR 120, this parantha is well-stuffed with mashed potatoes, paneer, onions and pudina. We think a plate of this would easily suffice two unless you have a big appetite.